A LITTLE while after I bought Dark Beyond The Stars, a sci-fi anthology by women authors, it prompted a little kerfuffle in social media. A thunderously awful review dismissed the work of the writers, patronisingly applauding them for "giving it a go" but suggesting that they leave it to those who know best - men. Does it really need to be mentioned how wrong-headed such a viewpoint is? Seemingly so, as people still perpetuate such things. But if we brush the sexism aside contemptuously, though perhaps with a quick mutter about Frankenstein's place in the science fiction firmament, how does the anthology itself stand up as a piece of work? The answer to that is... rather splendidly. A lot of these authors were new to me - but I'd heard of some, sampled others. It's never straightforward reviewing an anthology by different authors - some writing you inevitably enjoy more than others, but there is a consistently good level of quality across this collection. More than that, there are pleasant surprises along the way as a number of the stories take unexpected turns. Perhaps the one I enjoyed most was Carindi, by Jennifer Foehner Wells, which surprised me most of all. At first, it was a little difficult to get into with purposely unfamiliar names and an alien race at the heart of the story with demonstrably alien perspectives. But then, as the story progressed, it proved to be the most ambitious of them all in terms of the subjects it engaged with, playing with gendered pronouns and the notions of family, and what one would do for family, becoming quite, quite wonderful by story's end. Protocol A235 by Theresa Kay adds a chilling flavour to the collection, while Containment, by Susan Kaye Quinn, is perhaps the most inventive in the subjects it tackles, and the world it invents. That's the opener to the anthology, and you can see why it was chosen to slot in there, bringing with it an analytical approach to its subject of which a Clarke or Asimov would approve. Animal Planet, by Patrice Fitzgerald, is also a rollickingly good flashback to the kind of stories that Ray Bradbury wrote in his Martian Chronicles, great stuff. Dragonet, by Sara Reine, had me harking back to Anne McCaffrey, which is no bad thing, while Lulu Ad Infinitum, by Ann Christy, grew on me as the story progressed, telling its tale of endlessly long journeys in space and the sacrifices made by one woman, Lulu, to keep that journey going. It shares some connective tissue with Protocol A235 in that regard, but both then go about telling their tales in very different ways. Blair C Babylon's To Catch An Actor plays with the premises of celebrity, stardom and murder - with a police detective trying to outwit the actors who prolong their stardom with century-long near-light journeys that serve to only burnish their entertainment legend. There's fun in the premise, and a nice denouement, though this didn't grab me as much as others. Negatives? Well, I couldn't help but feel that Annie Bellet's story, while still really good, saw the author writing perhaps a little safely and well within her abilities rather than stretching things. It was Bellet's name on the cover that drew me in to the collection most - as I'd heard great things. The story tells a tale of military sci-fi, of war between species, and people willing to give their lives to retrieve an item that could make a difference in that war, and while it does its job perfectly well, it just feels a little formulaic. I'll come back for more by Bellet, though, as while this story never quite bubbles over, her writing is simmering with potential here. Autumn Kalquist's The Event was too loosely stream of consciousness to really catch my attention, however, feeling experimental rather than substantial, and I really didn't get into Elle Casey's Winner Takes All, which felt like fanfic rather than a fully formed story of its own. The story closing the book, 2092, by Rysa Walker, starts strongly but goes a little astray as it zigzags through the consequences of time travel, and feels like it drifts from the point it started out from rather than arrowing to a particular destination. A couple of the stories felt like they were spin-offs from some of the authors' larger works too, rather than as a piece unto themselves - but as a collection on the whole, this one's a winner, and a fantastic introduction to a number of these writers' work. Me? I'm off to snag myself a copy of Jennifer Foehner Wells' Fluency. 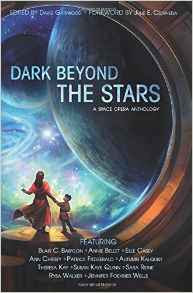 You can pick up Dark Beyond The Stars on Amazon. I believe in honest reviews, and have given my opinion having bought the book, honesty being the best policy... unless you're a replicant and Rick Deckard is asking you questions.